We are approximately 3/4 of the way through installing an insulated Oversheeting system to meet Building Regulations whilst incorporating an improved guttering layout to satisfy modern day design requirements. Existing rooflights and damaged internal lining panels are being replaced to further enhance the internal working environment for both employees and visitors. 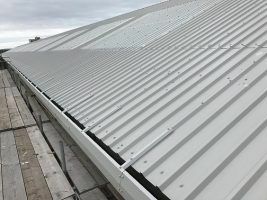 A full roof mounted safe access system will also be installed allowing the client to undertake regular inspections and gutter cleaning as part of a planned maintenance schedule, ensuring the new roofs performance and longevity.